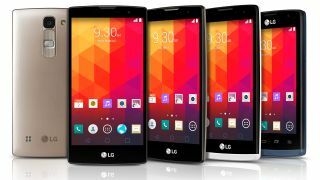 LG's newest phones... but a big upgrade is on the way. LG has been showing off a few phones at MWC this year, but the top-end LG G4 hasn't been spotted. According to the company's mobile chief Cho Juno, the handset is going to be "radically different" to anything that's come before - both inside and outside. The Korea Times reports a MWC interview with Juno in which he describes a phone that's a leap forward from the G3. It will feature a metal rather than polycarbonate casing, a major overhaul of its software design, and an improved user experience to boot. "We will announce LG UX 4.0 before announcing the LG G4," Cho told reporters. "I think it is simply the best and the issue is how to best fit the new UX system into the G4 smartphone." We're expecting to see the LG G4 at some point over the next couple of months. Cho Juno also confirmed that LG is working on a new high-performance mobile processor, one that may even appear in the LG G4. "Producing our own mobile application chips is very important," he said. "As LG Electronics has been consistent in developing these, we plan to gradually incorporate them into our new models." And there's word on those "new models" too. According to Juno, LG is busy on a new flagship line even more powerful than the G series - a new tier of high-performance handsets ready to be unleashed in the second half of 2015. The LG G line is already very powerful, and Juno didn't specify exactly how the new series would be differentiated, but he very clearly stated that it would be something that "stands above" the company's existing phones. With that in mind, don't let LG's quiet MWC fool you - it has big plans in store.